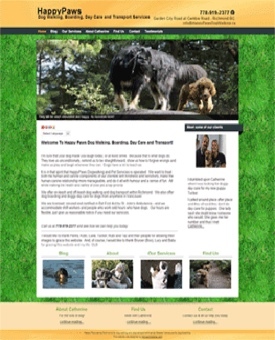 Catherine, the owner of Happy Paws Dog Walking (HappyPawsDogWalking.ca), wanted green as the main colour for her website, so Noticedwebsites created a colour scheme that features a green grass background, in keeping with a dog theme, with complementary colours (orange, dark gray) that makes her website “pop”. Also, the grass background gives the website texture, besides making the website look great. The site includes many features like a language translator, doggie slide show, map and more. 3) submit your questions, comments, etc. to our contact form for a prompt reply. Help Us Improve. Click/Tap to Give Feedback. Thanks! Would You Recommend Us To Friends & Family? Please review us on Google or Facebook, your choice! Thanks for doing so! Want clickable scrolling 5 Star Ratings of your business appear on your website like on this website? Ask me how I can set this up for you for FREE with a software trial!